•Choose Preview to run Sketchpad in Preview mode. Preview mode sessions are limited to 20 minutes at a time, and you cannot save, print, or copy your work. Teachers are not authorized to use Preview mode in the classroom, either for presentations or for activities or explorations with students. 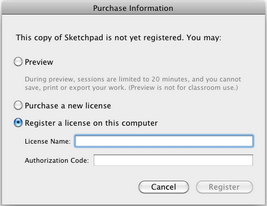 •Choose Purchase a new license to purchase Sketchpad and obtain an authorization code. •Choose Register a license on this computer if you (or your institution) has already purchased a license. You will need to enter the license name and the authorization code. On occasion, you may need deregister Sketchpad on one computer so that the license can be used on a different computer. To do so, choose Help | License Information and click Deregister. To prevent inappropriate deregistration, you must enter the full authorization code. Once Sketchpad has been deregistered on this computer, the command again becomes Purchase Information, allowing you to use Preview mode, purchase a license, or register a license on this computer. For more detailed information on licenses and the registration process, refer to the frequently-asked questions on this web page: Sketchpad License Use FAQ. 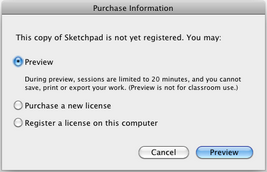 To purchase a license, go to this web page: The Geometer's Sketchpad® Version 5: Ordering.